Two wrestlers who will be gunning for medals at the World Championships later this summer knew what to do when the spotlight was on, while a few other notable prospects demonstrated the kind of toughness and talent that winds up creating stars for the future. As is often the case every year, the finals of the 2017 Cadet Greco-Roman Nationals at the Fargodome in Fargo, North Dakota delivered another glimmering series of matches that can turn any wrestling fan into a Greco devotee. One wrestler who was particularly impressive also happened to be one of the grittiest unsung heroes of the tournament. Outside of a tech-fall win in his first bout Thursday morning, Yusief Lillie (100 lbs, WA) was forced to bite down the rest of the way through. 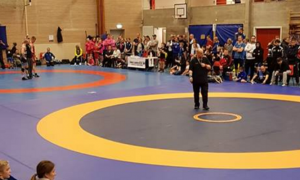 It was close match after close match for the first-year Cadet, and he managed to fight his way to the finals following a surprise win over Minnesota stud Paxton Creese in the semis. 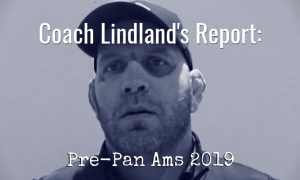 In the battle for his first Greco-Roman National title, Lillie was taking on 2016 US Cadet Greco-Roman World Team member Andrew Chambal (MI), an athlete longer on both experience and perhaps technical acuity. But that didn’t do all that much to derail the Washingtonian’s momentum. Lillie adopted a virtual breakneck pace to set the tone. Chambal offered a comparatively patient approach and it was clear he understood how to maintain his composure, something he had to do early and often against the hard-charging Lillie. The only downfall for Chambal might have been that he was too composed, because Lillie’s frenetic workrate wound up earning him a passivity point midway through the first along with a 1-0 advantage. In the second period, Chambal had a couple of close calls as he repeatedly clawed forward with two-on-one’s, but it was Lillie who seized the first real scoring chance as he slid-by Chambal and then spun around for two. Later on in the period, both athletes were headed towards the edge when Chambal appeared to have dumped Lillie down for two. A challenge by the Washington side rang in with the call being that it was Chambal who had actually stepped out first. 4-1, Lillie. Chambal tried to make make something big happen with time winding down, including an attempt at a Flying Squirrel. He was fighting to the end. 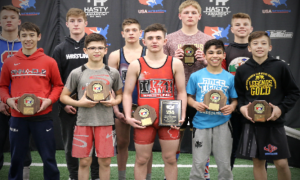 Ultimately it wasn’t enough, giving Lillie his first coveted Greco-Roman national plaque and two days in Fargo he will surely remember for a long, long time to come. 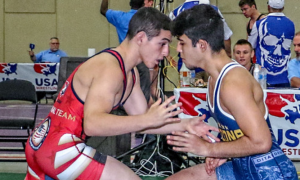 It was Illinois versus Illinois at 106 pounds with 2017 US Cadet Greco-Roman World Team member Dylan Ragusin taking on Matthew Ramos in a tight, spirited affair. The two traded tie-ups constantly with neither able to find any workable openings. Ramos edged himself a 1-0 lead on a passive call in the first period, though that tide would turn soon enough when Ragusin was awarded his own passive point. Ragusin did try chipping his way in from a distance, collecting inside wrist control and hawking forward. The problem for him resided in Ramos’ excellent positioning. Whenever Ragusin poured in, Ramos met the pressure with equal gusto, resulting in another passivity ding on Ragusin early in the second. That’s when the proceedings pivoted the other way. An arm throw attempt by Ragusin went loose and in the ensuing counter attack, Ramos quickly clasped around for a bodylock. When he went to take it back, Ragusin adjusted and landed on top for two points, jumping out in front 3-2. Eventually, Ragusin would receive another passivity point to give him a little breathing space. With a minute remaining, Ramos picked it up a bit and was able to force a step-out to climb back within one. Shortly after the reset and the clock beginning to betray him, Ramos then got over the top of Ragusin, bolted on a front headlock and wailed it — but time had just run out. Ragusin emerged as the victor 4-3 and in the process, collects his third straight Greco-Roman Fargo title, and his second tournament win of the week (he also triumphed in the freestyle portion). A head nod goes to Ramos, too. Last year, he was seventh at this event and showed impressive progress with his total performance this week. The final at 113 provided a showdown between two American age-group wrestlers with tons of promise and also, relevant overseas experience. Hunter Lewis (WI) is already a well-traveled athlete, having competed in Europe more than some Senior competitors, and he also just came back from representing the United States at the Pan Ams in Buenos Aires, where he was a silver medalist. In Conor Knopick (NE), he was facing a wrestler on the rise and a kid who himself has just started getting the feel for international competition. Knopick, if you remember, was part of that Go Greco Developmental tour of Croatia and Serbia last month. It seemed to be a stage set for a feisty, competitive match-up between two potential full-timers. However, this one was over before it really even had a chance to get started. They clashed right away. Knopick dug into the trenches and immediately went for an arm throw. Lewis didn’t fall with the maneuver and for some reason, was initially awarded two points. A subsequent challenge by the Nebraska side wiped the call off the scoreboard and we were back underway. Another throw attempt by Knopick saw Lewis counter by locking for a reverse lift — an astute choice because it forced Knopick to concede and belly down, allowing the Wisconsinite to scamper behind for two. Lewis took advantage and locked around for a gutwrench. It took some work, Knopick didn’t just roll over. But eventually, Lewis was able to churn him over twice for a 6-0 cushion. Once they were back on their feet, Lewis nailed a nice headlock for four and it was practically a done deal, as the fall came just seconds later. This was Lewis’ first Fargo Greco-Roman championship. 2016 Fargo Cadet Greco runner-up Reece Witcraft (OK) unveiled one of the most dynamic throws of the day and it came following some good action against Ryan Ripplinger (ND). Witcraft got going with a takedown and a turn to jet out to a 4-0 lead, but the train hadn’t left the station just yet, because Ripplinger answered right back with a beautiful four-point hip toss and for a brief moment, a criteria lead. Ripplinger, who took fourth at Fargo in 2016, was now working with confidence so after the reset, he went for another throw, this time a bodylock. Unfortunately for the North Dakota wrestler, Witcraft landed right on top of him for two, retaking the lead 6-4. There would be plenty more on the way. Witcraft coaxed Ripplinger out for a point. 7-4, Witcraft. He repeated the sequence again, holding a wrist-and-underhook tie while marching Rippinger out. Ripplinger, aware that he was going to have to start getting busy, lowered in for an arm throw only to have Witcraft instantly counter by reaching around his head and taking him to his back. When they returned to the feet, Witcraft zeroed in with a deep bodylock around Ripplinger’s midsection. He didn’t rush; instead, he secured the position and set his feet. As he did, Ripplinger, left with no choice but to try to do anything possible to avoid being tossed, went for a headlock. In an impressive display of technique (and style), Witcraft went with the motion and arched all the way back for the match-ending points. One of the country’s most well-known age-group wrestling commodities is Braxton Amos (220 lbs, WV), who punctuated his week of competition inside the Fargodome with victories in both styles — just like he did last year. In his final against Illinois’ Luke Luffman, Amos scored on a takedown before running four gutwrenches across the mat. It was over quickly. 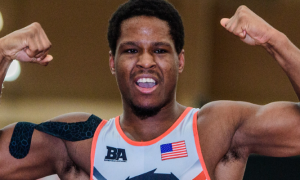 Altogether, Amos picked up four tech’s and a pin in his march to a second-straight Greco-Roman national title. He also had the distinction of competing against three Illinois wrestlers in a row beginning with the quarterfinals — Jacob Bullock, Jacob Kaminski, and Luffman. Amos defeated Bullock and Luffman via tech, though Kaminski put a scare into him in a fun, nail-biting type of bout that saw the West Virginian escape with thin 10-9 decision. The 120 lbs final between Phillip Moomey (NE) and Fabian Lopez (Ill) illustrates exactly why the United States could — if not should — be a consistent world power in Greco-Roman wrestling. There is no doubt that Moomey’s and Lopez’s folkstyle backgrounds provided the backdrop for a lot of the attacks both leaned on during their meeting on Friday. 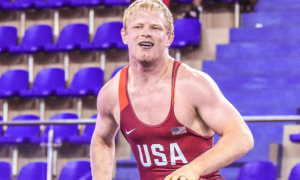 That is largely what Fargo is, athletes translating folkstyle strengths into Greco points. But it was also just the motion, intuitiveness, and brand of overall startling athleticism present during their battle that stood out, and it’s also probably why they were able to bring out the best in each other. Lopez drew first blood when he hit a flash duck-under to get under and behind Moomey, a sequence he used to transition instantly into a gutwrench. A work of art. The duck-under would play a substantial role in this match, for both wrestlers. Moomey responded by stifling another Lopez attempt and lassoing on a front headlock. Once secured, Moomey stepped up and shucked Lopez to collect his own takedown before rolling a gutwrench that was a little too loose. Lopez reversed position to grab a point and assume a 5-4 lead, the proceeding par terre providing no further scoring for the Illinois wrestler. They stood back up. Lopez dropped down for another lightning duck-under to net a takedown. Up 7-4 with just a little over a minute left in the first, Lopez seemed as if he was going to be able to repeat this pattern at will if Moomey didn’t make adjustments. Restarted on the feet once more, Moomey began to get a little more physical in his tie-up attempts. He reached in and locked around Lopez’s head and arm, the position drawing him right into Lopez’s body. He kept his lock around the waist and came out to the side with Lopez having to go to his stomach. From there, Moomey nestled a gutwrench and just like the first time, didn’t have the requisite tightness despite getting one turn out of it. It was a four-point play for Moomey, but Lopez once again reversed and wound up on top. 9-8, Illinois. One last reset remained in the opening period and it was here where the momentum shifted. With :05 left on the clock, Moomey blitzed in on a duck under. He then roped around for a bodylock, driving Lopez straight to his back. Four big points were confirmed and all of the sudden, Moomey entered the break between periods holding a 12-9 advantage. To begin the second, Moomey picked up a step-out to widen the gap to 13-9. Lopez still operated with a sense of urgency. He dipped, ducked, and prodded to explore ways to clash inside. For his part, Moomey wasn’t content to just sit back in the pocket willing to give away passivities. The fighting was tactical, each wrestler feinting attacks and stepping forward. Lopez knee-dropped for his third duck-under try, an attempt that was stymied immediately by Moomey, who went heavy on the head. Lopez, intent on doing something, anything to come up with a way to score, tried mixing up his looks as precious seconds disappeared from the scoreboard. But Moomey was able to stay on his feet and see this one the rest of the way through, earning himself his first National championship, though both wrestlers should be acknowledged for the display they put on in the country’s grandest age-group event. 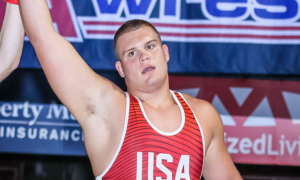 2017 US Greco-Roman Cadet World Team member Ashton Sharp (195 lbs, MO) picked up the USA Wrestling triple crown with his win yesterday. Sharp went at it with up-and-coming Illinois prospect Peter Christiansen and came away with a 4-0 win on the strength of an early takedown and a correct throw, both coming in the first period. There were three pins and three technical falls in the finals. The three Greco power states once again represented well. Seven Illinois wrestlers made the 2017 US Cadet Greco-Roman National finals with two champs. Wisconsin and Minnesota tied with four finalists — Wisconsin had two champions to Minnesota’s one. Nebraska is steadily joining the big three and had three finalists and one winner. Michigan went 1-1 in the finals, as did Washington and Missouri.